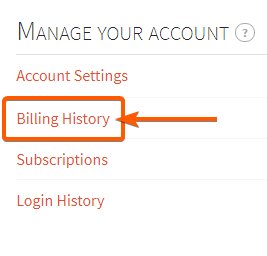 Login to the My Account page of your Internic account and select Billing History from the center column. On the right side you will be able to adjust the date-range by clicking Week, Month, Year or Custom. You can also click Advanced Search and search you billing history by credit card and/or domain name. To view a brief description of your order simply click on the order number. You can then click on View Printable Version. If you would like to view or print a copy of your detailed invoice or receipt click on either document under the Invoice/Receipt tab.